• The money meant nothing to a team $20 million under budget, but signing Kendrys Morales carried more downside for the Twins than commonly believed because his performance was tough to predict after sitting out the first two months of the season and the move meant stalling Josmil Pinto's development in favor of a potentially inferior player. With that said, no one could have expected things to go as badly as it did. While batting almost exclusively fourth or fifth in the lineup Morales hit .234/.259/.325 with one homer and a 27/6 K/BB ratio in 39 games, posting a lower OPS in a Twins uniform than, among others: Tony Batista, David McCarty, Nick Punto, Mike Lamb, Clete Thomas, Juan Castro, Adam Everett, Rondell White, Terry Tiffee, Denny Hocking, Tommy Herr, Henry Blanco, Matt Tolbert, Luis Rivas, and Aaron Hicks. To the Twins' (partial) credit they cut bait instead of stubbornly sticking with Morales for the rest of the season and to my surprise they actually got another team to assume the remainder of his contract and give up a potentially useful player in return. By trading Morales to the Mariners the Twins save about $4 million of his $7.4 million contract, but their lack of spending means the money probably won't be re-invested in the team anyway. Where they could get value is from Stephen Pryor, a 25-year-old reliever whose average fastball clocked in at 96 miles per hour before shoulder surgery. So far Pryor has struggled since coming back, with a big drop in velocity and poor Triple-A numbers, but there's still some potential there. They basically paid $3 million for 39 terrible games from Morales, the motivation to demote Pinto to Triple-A, and a post-surgery version of a once-promising reliever. • Matt Guerrier's decent-looking 3.86 ERA masked a terrible 12/10 K/BB ratio in 28 innings and similarly underwhelming raw stuff. 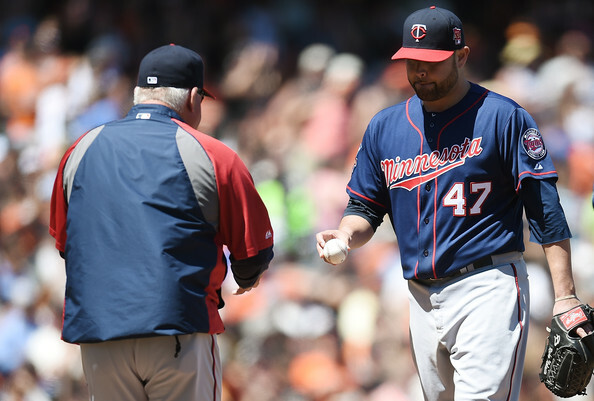 Guerrier is one of the most underrated pitchers in Twins history thanks to a six-year run as a durable, reliable setup man during his first go-around in Minnesota, but the reunion worked out only slightly better than this year's other reunions with Jason Kubel and Jason Bartlett. • Ryan Pressly replaces Guerrier in a middle relief role after posting a 2.98 ERA and 63/21 K/BB ratio in 60 innings at Triple-A. Pressly spent all of last season on the Twins' roster as a Rule 5 pick and held his own as a 24-year-old, but his control is shaky and his strikeout rate hasn't matched his fastball velocity. He has a whole lot more upside than Guerrier, however, so the switch makes plenty of sense even if it pained the Twins. This season the Twins have used a pitcher younger than 25 years old for a grand total of 12.1 innings, all by reliever Michael Tonkin. Meanwhile, across MLB there have been 447 games started by pitchers younger than Meyer and 504 games started by pitchers younger than May. • Vance Worley, whom the Twins gave away for nothing this spring without needing to for any real reason, tossed a complete-game shutout Monday and is now 4-1 with a 2.54 ERA and 30/8 K/BB ratio in 50 innings for the Pirates. When the Twins acquired Worley from the Phillies as part of the Ben Revere trade he looked like a solid middle-of-the-rotation starter and now at age 26 he looks like that again in Pittsburgh. • Old friends Danny Valencia and Liam Hendriks were traded for one another Monday, as the Royals and Blue Jays swapped role players. 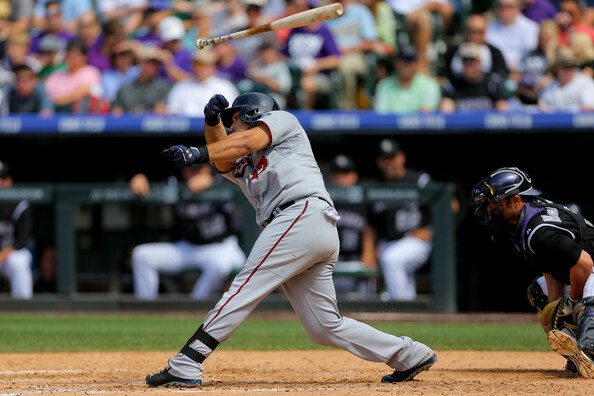 Valencia proved stretched offensively and defensively as an everyday third baseman for the Twins, but has settled into a part-time role mostly facing left-handed pitching. Hendriks continues to thrive at Triple-A and struggle in the majors while frequently finding himself on the waiver wire since the Twins gave up on him in December. • Because no Twins prospect is ever safe, both Kohl Stewart and Jose Berrios have been shut down with shoulder injuries. That means four of the top five prospects in my preseason rankings have been sidelined by an injury. • Byron Buxton is healthy again after missing nearly half the season with a wrist injury and has hit .378 with a .472 on-base percentage and .622 slugging percentage in his last 10 games at high Single-A. • Mike Berardino of the St. Paul Pioneer Press (with the help of Glen Perkins) did a nice job laying out the disconnect between Kurt Suzuki's defensive reputation and defensive numbers. • Oswaldo Arcia smashed his bat over his knee, Bo Jackson-style, after a recent strikeout, but with 183 strikeouts in 151 career games perhaps he shouldn't be blaming the equipment. 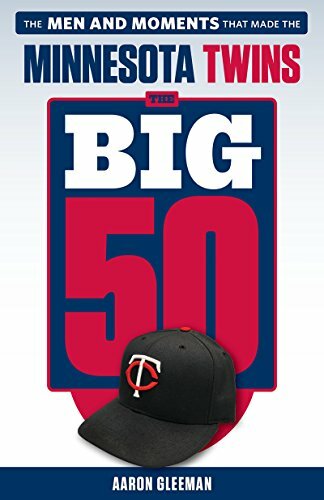 • Since signing him last season the Twins have a .346 winning percentage when Correia starts and a .443 winning percentage when anyone else starts. • Brian Dozier is hitting .178 with 29 strikeouts and four walks in 28 games since June 25. • FOX Sports North showed a great scouting report on Darnell before his first MLB start. 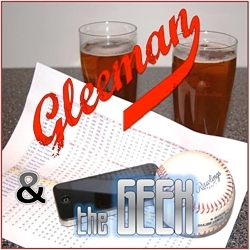 • On this week's "Gleeman and The Geek" episode we talked about realistic options at the trade deadline and wondered how thin the ice is getting under Ron Gardenhire and Terry Ryan. 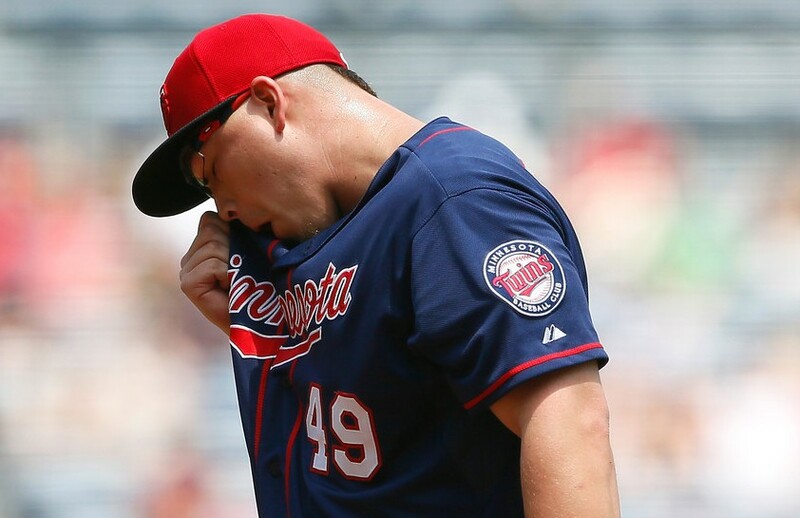 Vance Worley got knocked around for eight runs while failing to make it out of the fourth inning against the Braves yesterday and immediately after the game the Twins demoted him to Triple-A. Worley went from Opening Day starter to minor leaguer in two months by starting 10 games with a 7.21 ERA and allowing 43 total runs in 48.2 innings. When a pitcher struggles that much it's often due to terrible control, but Worley walked just 1.5 batters per start. Instead he struggled because hitters simply teed off on his 89-mile-per-hour fastball and sub par off-speed stuff, clubbing Worley for an MLB-high .381 batting average and .574 slugging percentage. To put that in some context, the last MLB player to hit .381 or higher and slug .574 or higher in a season was George Brett in 1980. And before that it was Ted Williams in 1957. In other words, Worley turned every hitter he faced into a Hall of Famer. No one expected Worley to be a top-of-the-rotation starter when the Twins acquired him from the Phillies along with prospect Trevor May for Ben Revere and he got the Opening Day nod by default, but with a 3.50 ERA in 278 innings through age 24 he certainly seemed capable of slotting into the middle of the rotation for several years. And that may still prove true if Worley can get back on track at Triple-A, but his ability to generate swinging strikes is in doubt. Worley averaged 7.7 strikeouts per nine innings for the Phillies, which was above average for NL starters, but a huge percentage of them came on called third strikes. Striking hitters out looking is definitely a skill, but it's awful tough to sustain at the degree to which Worley relied on it. And sure enough this year batters swung at Worley's strikes nearly 20 percent more often and he's the only MLB starter with a swinging strike rate below 4.5 percent. If you can't get hitters to swing and miss at pitches and they stop taking pitches in the strike zone enough to rack up called third strikes ... well, what happens is your strikeout rate drops from 7.7 per nine innings to 4.6 per nine innings and everyone looks like a Brett/Williams clone. There was also some bad luck mixed in, including a batting average on balls in play above .400, but however you slice it Worley pitched terribly and raised worrisome questions. 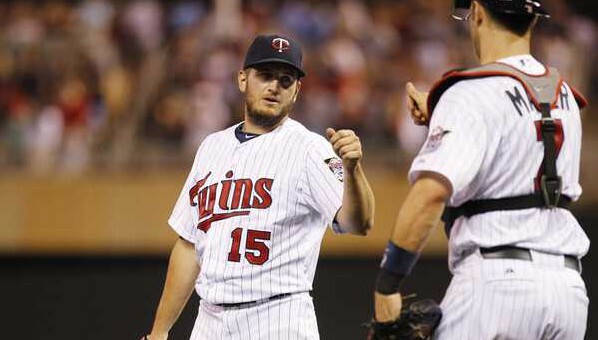 Last season Twins starters averaged 5.4 innings per start with a 5.40 ERA. 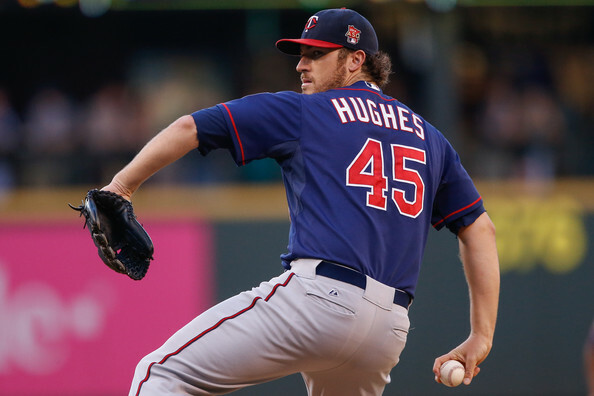 This season Twins starters have averaged 5.2 innings per start with a 5.69 ERA. And not only are they giving up more runs in fewer innings, the already abysmal strikeout rate is down from 5.5 to 4.2 per nine innings and the opponents' batting average is up from .287 to .330. And even the rotation's supposed strength, inducing ground balls, hasn't led to an actual increase in ground balls. Numbers that hideous usually mean things can't help but improve, but then again that seemed likely to be true after last year's debacle and yet here we are. More than a quarter of the way through the season Twins starters have recorded 16 outs per game while allowing nearly six runs per nine innings and opponents have hit .330 off them. I'd hate to see how unspeakably bad the rotation would be if improving it hadn't been the supposed focus of the offseason.